THE MANHUNT IS OVER … ISLAMIST TERRORIST RESPONSIBLE FOR BERLIN CHRISTMAS MARKET ATTACK IS KILLED!!! Anis Amri, the 24-year-old Tunisian has been shot and killed by police in Milan, Italy. The terrorist suspect responsible for the deadly Berlin Christmas market attack has been soot dead in the Sesto San Giovanni district of the northern Italian city. The terrorist behind Monday’s deadly attack on a Berlin Christmas market swore allegiance to ISIS before dying in a wee-hours shootout with police in Milan Friday, some some 675 miles from the scene of Monday’s carnage. Anis Amri, the 24-year-old Tunisian whose monstrous attack sparked a 72-hour manhunt and raised questions about Germany’s inability to come to grips with radicals among its burgeoning refugee population, was killed in the Sesto San Giovanni district of the northern Italian city, police said. Before his death, Amri pledged his allegiance to ISIS leader Abu Bakr al-Baghdadi and called for jihadists to take revenge on “crusaders” bombing Muslims, a video posted on Islamic State’s Amaq news agency showed. It was not clear if the video was made before or after the Berlin attack. Video released of the Berlin Christmas market terrorist suspect Anis Amri pledging allegiance to ISIS. Video has emerged of the Berlin Christmas market attack suspect Anis Amri pledging allegiance to ISIS. The footage emerged hours after he was killed in an early-morning shootout in Milan on Friday morning. The Tunisian man, who has been the subject of a Europe-wide manhunt since Monday’s market attack in which 12 people were killed, was stopped in Sesto San Giovanni — a district in the northeastern part of Milan — just after 3am local time, Italian police said on Twitter. A video released Friday on ISIS-affiliated website, Amaq, shows Amri pledging allegiance to the group’s leader Abu Bakr al-Baghdadi. He does not refer to Monday’s attack. When the man was asked for his papers by Italian police, he pulled a .22 calibre gun out of his backpack and fired at them. Chancellor Angela Merkel finds herself in a precarious situation as the German people march in the streets and demand that “SHE MUST GO.” This is in response to her ‘open-door’ policy that many have blamed for four brutal terrorist attacks that left 13 dead over the last month. Three of the attackers were among 1.1 million who entered as refugees as part of Merkel’s open door policy. But what does Merkel do, defends her policy as innocent Germans are murdered. This is what happens when you have open borders and let not only terrorists into your country, but also individuals who have no intention of ever assimilating to your culture. Suicide bomber in Germany pledged allegiance to ISIS leader. 21year old Syrian refugee hacks PREGNANT woman to death with machete and injures two others before hero BMW driver runs him over in yet another attack in Germany. ISIL flag found in room of German train attacker. 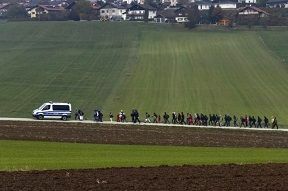 Guess what America, this is what is in sore for the United States as well as Barack Hussein Obama and Hillary Clinton want to do the same and bring in unvetted refugees from parts of the world that hate the US and where ISIS has stated that they will infiltrate the refugee population. Merkel’s premiership is hanging by a thread today as thousands gathered to call for her resignation while a key political ally dramatically withdrew his support over immigration policy. More than 5,000 protested in Berlin and thousands more throughout Germany over the ‘open-door’ policy that many have blamed for four brutal terrorist attacks that left 13 dead over the last month. The Chancellor faced a fresh wave of fury after it emerged that two recent terror attacks and a third killing were carried out by men who entered the country as refugees. Iran and six nations led vigorously by the United States to reach a deal at any cost has finally reached a historic accord on this morning with regards to Iran’s nuclear capabilities. The members of the panel are Britain, China, France, Germany, Russia, the United States, the European Union and Iran. Aside from all the platitudes from Barack Obama and Sec. 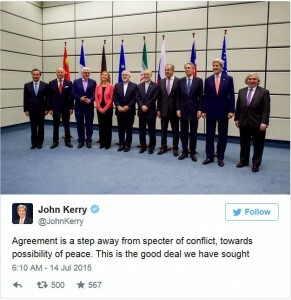 of State John Kerry touting this deal as the greatest thing since the Magna Carta, so we are supposed to trust that Iran is going to do what they say, really? When has Iran ever done what they said they would do? Sadly, this deal is a joke and will cause a nuclear arms race in the Middle East. To check the Iranians we have to put a request into Iran for inspections and Iran has 14 days to respond. Really? Because the Iranian government and Mullahs have changed, they are such trust worthy people. Meanwhile chants continue in the streets of Iran to death to America and Israel. This was an Obama deal for a deals sake as it was too big to fail. All we can hope is that this deal gets nixed in Congress and both House and Senators from both parties show a backbone and place US security and Middle East stability before party politics and Obama’s legacy. Iran and a group of six nations led by the United States said they had reached a historic accord on Tuesday to significantly limit Tehran’s nuclear ability for more than a decade in return for lifting international oil and financial sanctions. One of the last, and most contentious issues, was the question of whether and how fast an arms embargo on conventional weapons and missiles, imposed starting in 2006, would be lifted. After days of haggling, Secretary of State John Kerry and his Iranian counterpart, Mohammad Javad Zarif, agreed that the missile restrictions would remain for eight years and that a similar ban on the purchase and sale of missiles would be removed in five years. Those bans would be removed even sooner if the International Atomic Energy Agency is able to reach a definitive conclusion that the Iranian nuclear program is entirely peaceful, and that there was no evidence of cheating on the accord or any activity to obtain weapons covertly. The provisions on the arms embargo are expected to dominate the coming debate in Congress on the accord. Even before the deal was announced, critics expressed fears that Iran would use some of the billions of dollars it will receive in sanctions relief to build up its military power in the region. Iranian officials, however, have said that Iran should be treated like any other nation, and not be subjected to an arms embargo if it meets the terms of a nuclear deal. Iran nuclear deal: historic agreement in Vienna. 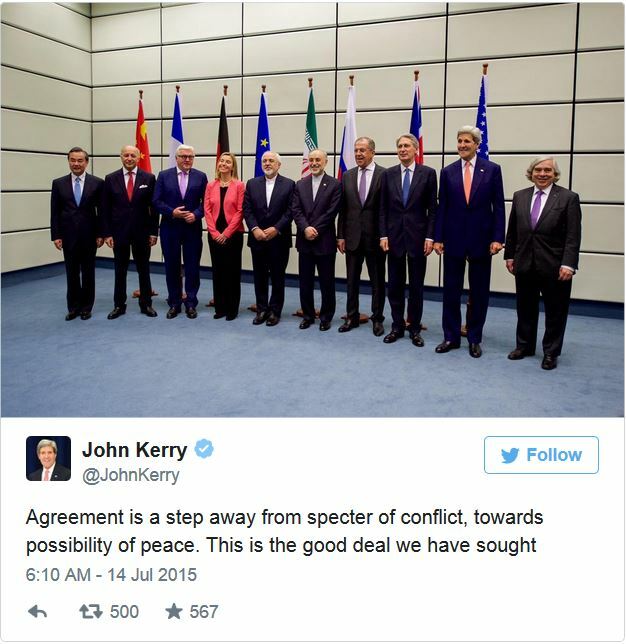 John Kerry said the implementation of the deal is more important than the text. “I’m not going to stand here and tell you every is going to work without a hitch,” he told reporters. Iranian negotiators have repeatedly reassured the US that they have a full mandate from President Rouhani and the Iran’s supreme leader Ayatollah Ali Khamenei, the US secretary of state said.